Dr. Jean-Michel Millepieds is a French psychiatrist who works in the Quiet Ivy. 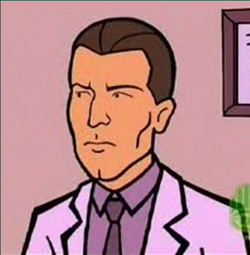 He makes his only appearance in the episode Psycho Therapy, where he interviews Daria. Dr. Millepieds exhibits genuine concern for Daria and comes to appreciate her take on her family's problems, a reversal of the staff's original plans for her. (She was originally believed to be mentally unsound because of the sarcastic way she filled out a questionnaire.) He admits to her that he thought she had deep issues, but after meeting her family he considers her "remarkably well adjusted...considering". During his interview with Daria, he unsuccessfully attempts to do hypnosis and past-life regression: instead of affecting Daria, he sends Quinn into a trance. Quinn had a massive crush on him, and disrupted his sessions as a result. He found this irritating. Later in the episode, he is seen counseling Mrs. Johannsen. The MTV website has a monologue by Dr. Millepieds, which reveals Dr. Millepieds french nationality and his psychiatric diploma, specializing in family dynamics, couples therapy and homeopathic hypnosis for weight loss. It further reveals that this diploma allows him to practice cosmetic acupuncture and pull teeth. On the MTV site, he guides us through the various couples of the Daria show in the MTV flipbook "It Takes Two to Tangle". This also reveals his thoughts on the various pairings of the show, including Jake and Helen: "...In all of my years of practice, I have never seen such a fecund display of bizarre interpersonal dynamics as among the couples featured in Daria--and that includes my years spent living among the Bonobo monkeys. I am more than happy to offer my professional diagnostic opinion in the hopes that others will be inspired to stay far away from these people." His appearances in fan fiction include the following. Daria Encyclopedia 0.0: search for "Jean-Michel"
This page was last edited on 5 April 2018, at 16:02.